Hunter Valley Chocolate Company, Hunter Valley Wine Country, NSW, Australia. 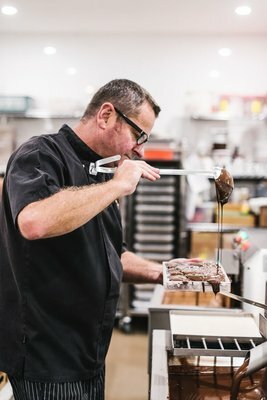 Established at the turn of last century, the Hunter Valley Chocolate Company has grown to become one of the of the region’s premier attractions, earning a reputation for quality and innovation and gathering a legion of chocolate aficionados across the country. We continually strive for perfection and use only the finest Belgian couverture chocolate, together with Australian dried fruits and nuts. A distilled pure fruit oil is used for infusion and results in a subtle but true flavour of the fruit. We prefer to keep fillings and flavourings very simple as the chocolate should be the experience. Hunter Valley Chocolate Company also provides a varied range of wedding and corporate packages, gift hampers and baskets, perfect for any special – or everyday – occasion. With chocolate having become the most generally accepted item for gift giving worldwide, we certainly can cater for every celebration. If you love chocolate we are sure to delight!!!!! Please enjoy browsing our online store or visit one of our 3 Hunter Valley locations for a true taste sensation. "Twenty-3-Twenty" @ 2320 Broke Rd, Pokolbin NSW 2320.